Coconut oil is one of my favorite natural products. 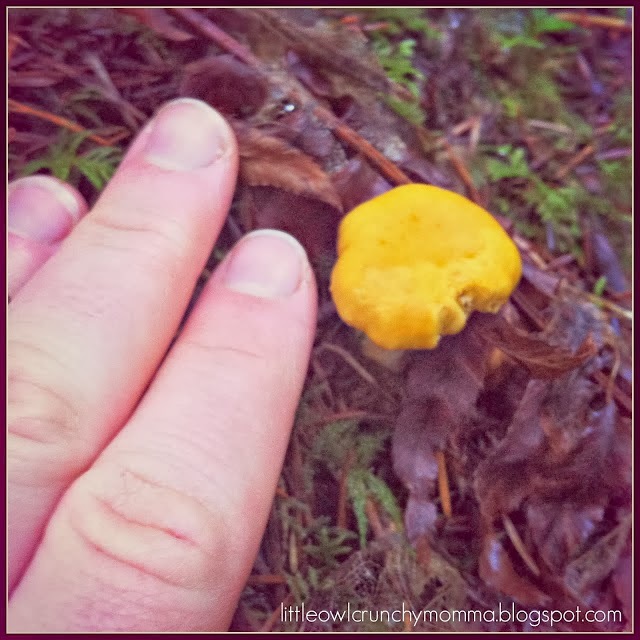 It is multi-faceted - it can be consumed and can be used for body care and home care. I mainly use it for body care and for baking and yes, for oil pulling in the mornings. 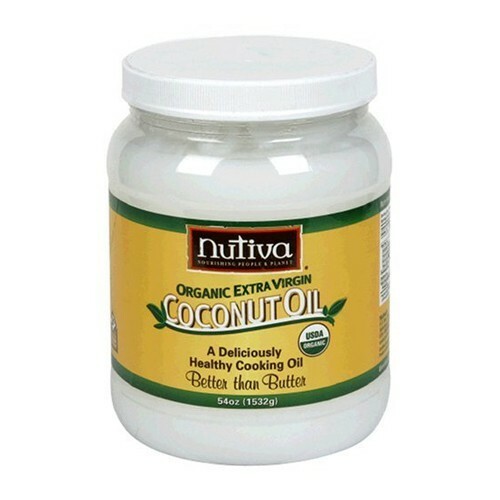 More on oil pulling can be found on here and here. It's recommended to pull for up to 20 minutes a day. I wish I could go that long but the texture gets to me after several minutes but I shoot for 7. What is your favorite natural product that offers multiple uses? 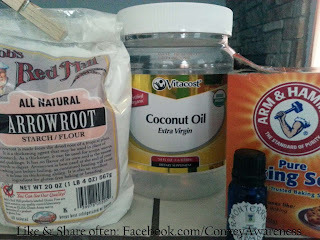 In this blog post, I will list 10 of my favorite ways to use coconut oil. If you'd like to learn another several hundred ways, I recommend visiting Hybrid Rasta Mama. 1). We use coconut oil for a body moisturizer. After bathing and patting dry, the coconut oil works superbly for me in the warmer months. However, I find that I have to mix the coconut oil with other quality oils like jojoba or avocado, and shea butter to combat dry, wintry skin. I've made my own body butter as seen here. Either way, I'm still using the coconut oil either direct or with another product for my skin from the tips of my toes to the top of my forehead and everywhere in between (including on my hair more in #2). Coconut oil has a natural SPF albeit low (around 5-8) it is still offering some protection. I've used coconut oil on my skin directly after getting sun burned. It helps relieve the burning as well as expediting my skin's healing process. 2). Coconut oil is a great hair moisturizer especially if your hair is thick and wavy or curly. I started no-pooing in February (2013) and use coconut oil on my hair after it's been washed and conditioned. Learn more about my no-poo experience here. 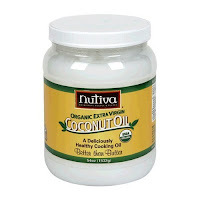 I only apply the coconut oil from the nape of my neck to my ends and reapply daily as needed. I use a nickel size amount if that. A little goes a long way and you'll know when you've used too much so, start out with a pea size and slowly work your way up. 3). Coconut oil makes a great shaving lotion. I mix equal parts of baking soda with coconut oil and apply directly to the area I will shave. 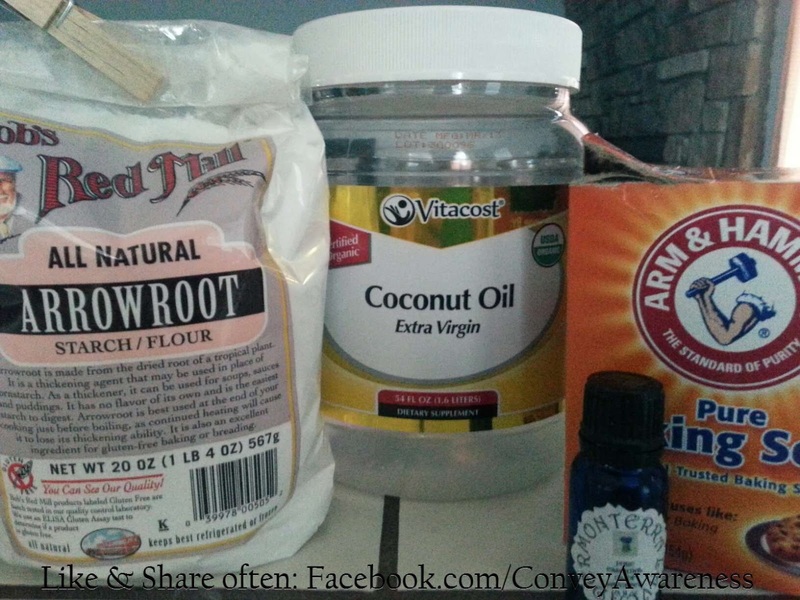 If you find that your skin is sensitive to the baking soda then add more coconut oil. There is no wrong way to mix it. 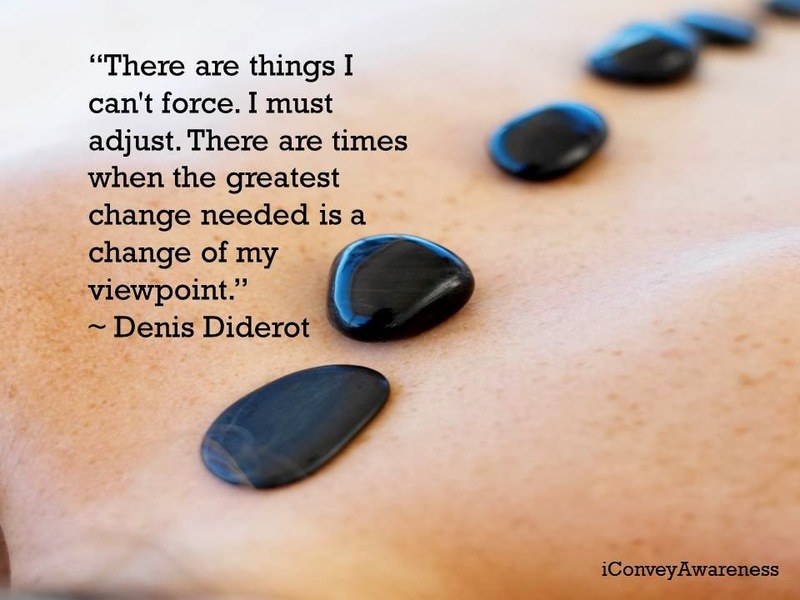 Adjust where you see fit. You can also leave out the baking soda. In either case, you'll find that your razors last A LOT longer! 4). The same 'shaving lotion' can be used as a gentle skin exfoliator, too. 5). Coconut oil can be mixed with sugar and an optional essential oil for a foot and / or hand scrub. 6). Coconut oil is used to calm itchy skin. Next time you experience an itchy rash, reach for the coconut oil first then reapply daily as needed. 7). Coconut oil is a common ingredient in DIY deodorants. 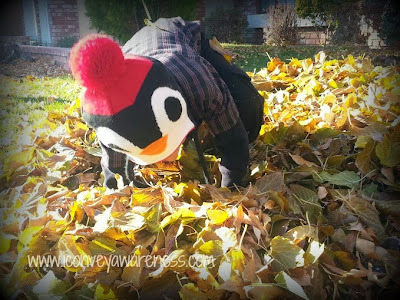 The image below shows what I have used during the cooler months. I live in the desert and the temperatures can get in the triple digits during the summer, so I recently purchased a natural deodorant from Tehacha-Bee Farm that stays solid. 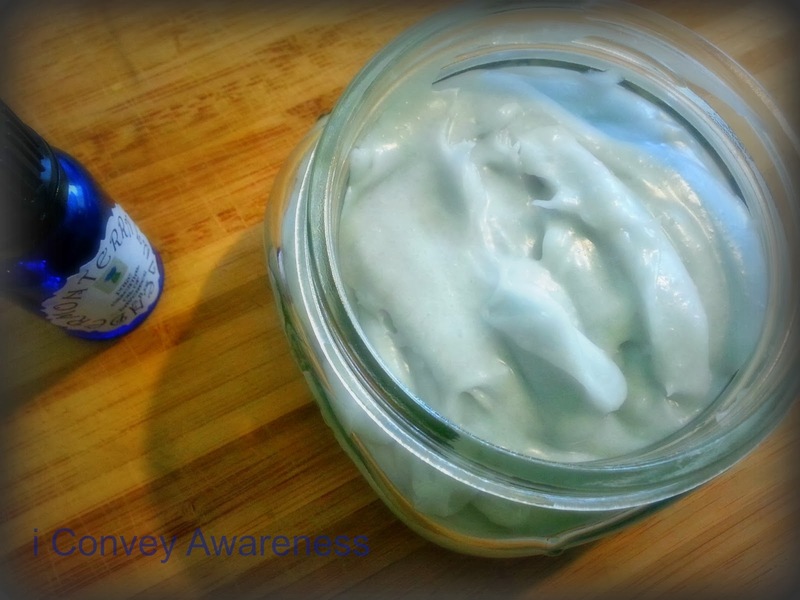 If you'd like a DIY homemade deodorant for sensitive skin using bentonite clay, I recommend checking out OhLardy!. My 4 year old has been asking to brush his teeth in the middle of the day with the 'new' stuff as he likes the way his teeth feel afterwards. The paste is sticky... well, it's kind of like the texture of the tooth paste that a dentist uses. Takes a few thorough rinses before it's all out. But goodness it is one that I can brag about because it tastes great during and after! Thank you Coconut Mama for a home run! 9). Coconut oil is a make-up remover. 10). Coconut oil is a lip moisturizer. What is your favorite ways to use coconut oil? Did I leave any out that you'd like to share? If so, please leave a comment below. 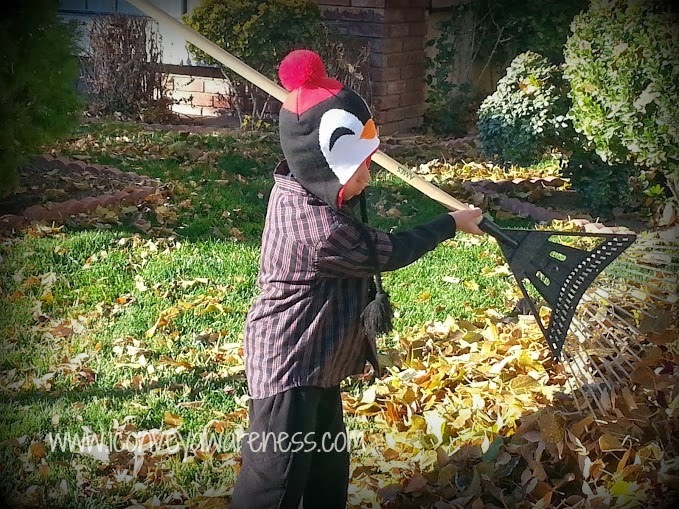 One of the tips I share with you as a Certified L.E.A.N. Health Coach is to eat a brainy breakfast daily to kick off your day right! The standard formula is 3:6:3. At least 3g of fiber, no more than 6g of sugar, and at least 3g of protein. Of course these are guidelines, so stick to the formula as much as possible. I wasn't always this way. Matter of fact, I disliked eating breakfast and would almost always grab a honey bun or cookies. I did this through my late 20s. You know the invincible era? No wonder I had GI issues - I can attribute that to the amount of sugar I consumed from a small child until I reached my third decade. I still enjoy sugary foods but I do my best to control the ingredients. I regress a bit. 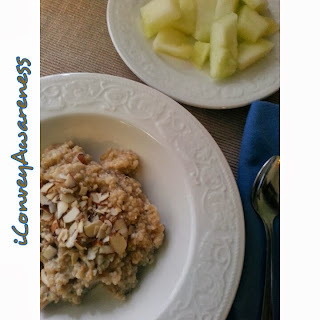 While I've been on the Clean Transformation Challenge, I have learned to like breakfast and have actually been looking forward to eating (or drinking) it most days! This day I served up some steel cut oats sweetened with 1/2 tbs of pure maple syrup, 1 tbs of hemp seeds, and 1 tbs crushed sliced almonds. Delicious!! I served honeydew on the side. I'm a bigger fan of having fresh fruit on the side of my warm cereals. This dish packs protein, iron, and fiber! 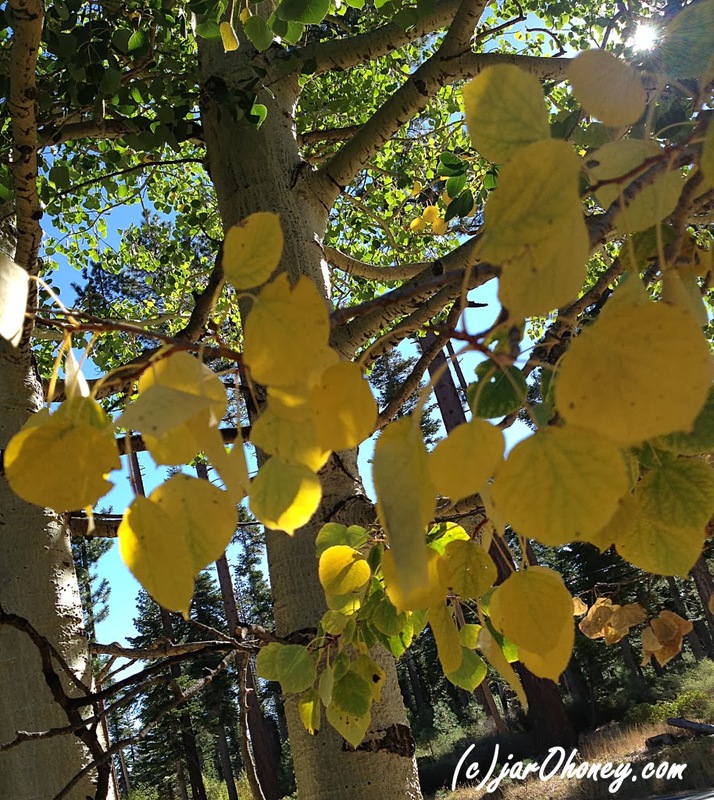 Follow me on Facebook, Twitter, Instagram, and Pinterest. 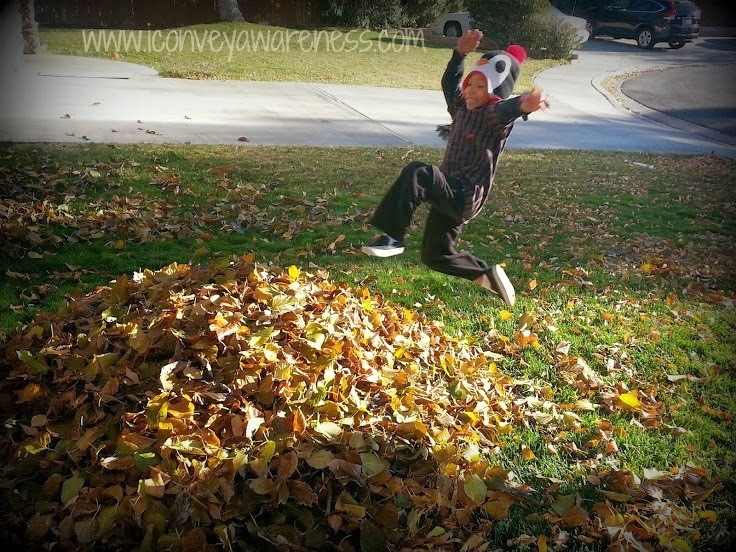 With this season winding down, tell me, what is the best part of Autumn? Is it the changing of leaves, going on a nature walk looking for treasures, or jumping into a pile of raked up leaves? Today's post includes images from a few bloggers sharing their joys of the season. Feel free to comment with images from your own adventures! First up - my son. The first image is from 2012 and the others are from this year. 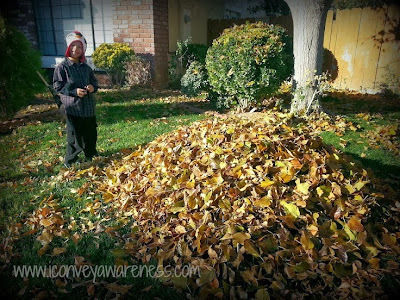 We are blessed to have two mature trees in our yard offering up the best of the best of Autumn (in our opinion!). He rocked his pajamas in the back yard last year. This year he helped rake up the leaves into a bigger pile! Thanks for the help! For additional learning curriculum, the Untrained Housewife has included several preschooler activities for this season including songs, crafts, and learning the alphabet via nature. 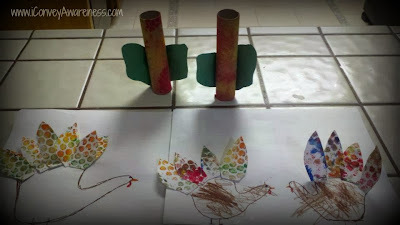 I've included my son's Autumn craft from last Thanksgiving below. You're invited to leave a comment with a special memory from this season. I follow some awesome food blogs. 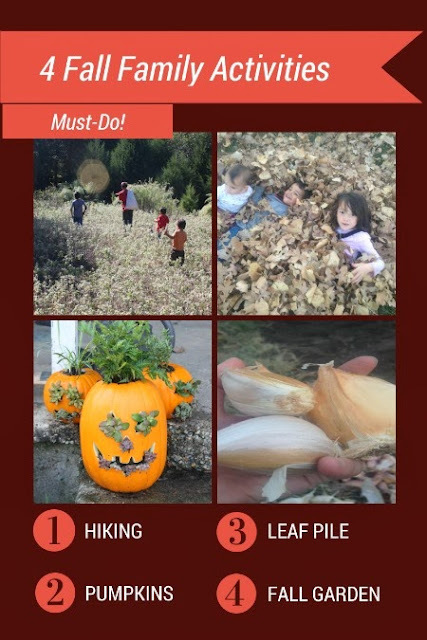 Most of the time I'm pinning and sharing their resources in the hopes of making some of them for my family. 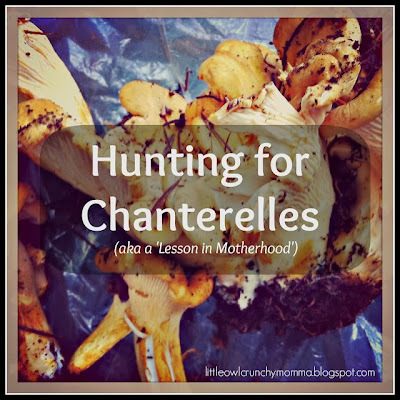 This day I pinned, shared, and cooked! 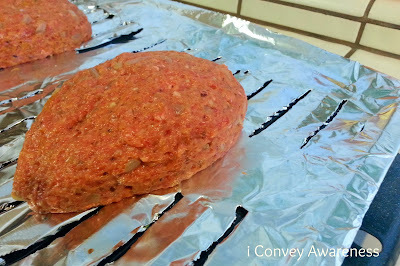 It was my first time making a grain-free meatloaf. I don't follow any diets or styles of eating like Paleo, WAPF, and the likes, but I do enjoy experimenting in the kitchen. For my meatloaves, I typically use plain Panko bread crumbs and add my own spices to it. I've noticed the last few times though a slight inflammation after consuming it with grains. So, why not try something different! I must say that I didn't experience the bloating afterwards. The best though was my family's enjoyment of the dish. 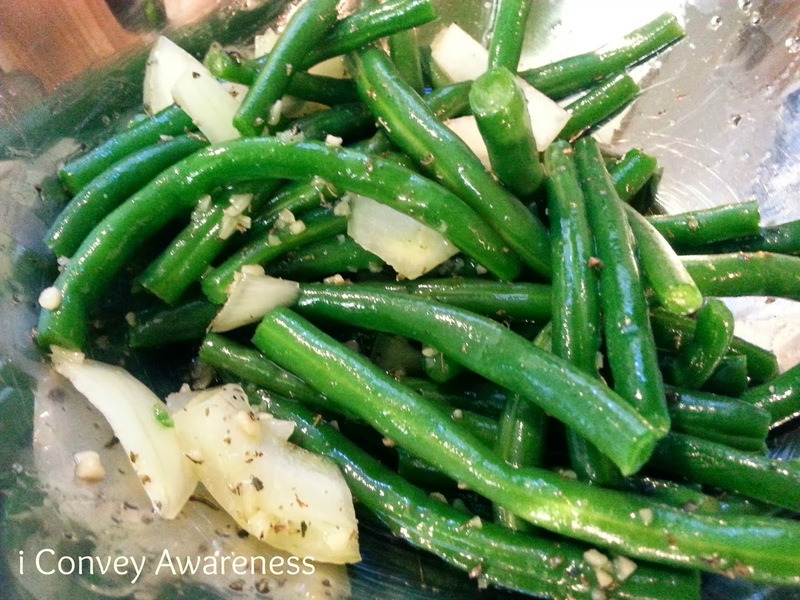 I was about to write - entire dish, but I recall that my son is not a fan of green beans. I know, I know, most kids like green beans and corn but my son is different - he likes squash and other veggies most kids don't take to very well. He doesn't like corn either. The recipe for the meatloaf is from Life Made Full. I made some modifications because that's just what I do. Below is the recipe that includes my changes and the rest of the ingredients for the two sides - roasted green beans and mashed potatoes. Click on the title below for her full recipe. 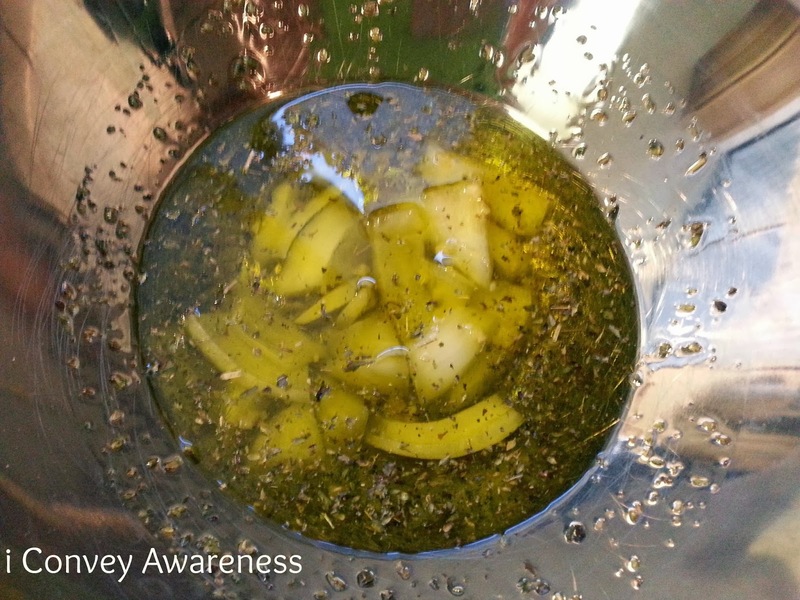 Brown the diced onions with garlic in 1 T EVOO in a pot (not skillet) on medium low heat. You'll be using this same pot for the rest of the meal. This takes about 10 minutes. Preheat oven to 350 degrees and line a broiler pan with foil. In a bowl, combine all ingredients incorporating onions and garlic last. Shape loaves with your hands and bake for 40 minutes. Internal temp must reach 160. 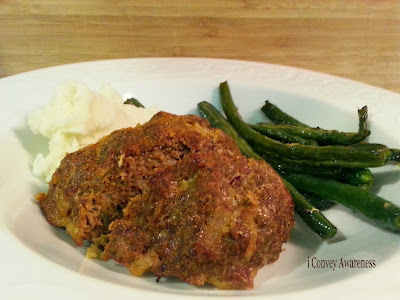 While the meatloaf is baking, you'll be preparing your green beans and mashed potatoes. Cut off the ends as shown above. You will add spring water to the pan that you cooked the onions and garlic in. 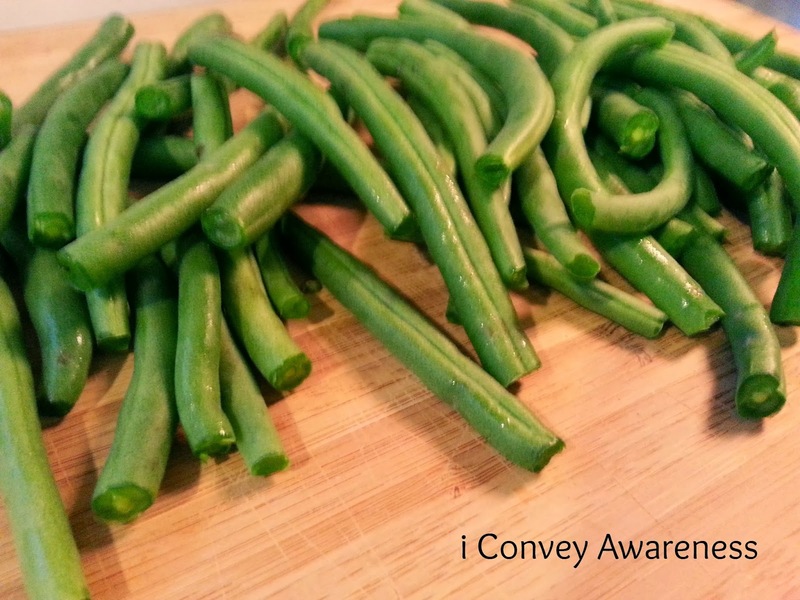 When water comes to a boil, add the green beans in carefully and blanch them for 3 minutes. Drain the beans saving the water from the pot. You'll need this again for the mashed potatoes. Note: Using the same pan for an entire meal helps develop flavors so that each dish has a hint or two of the other items on the plate. 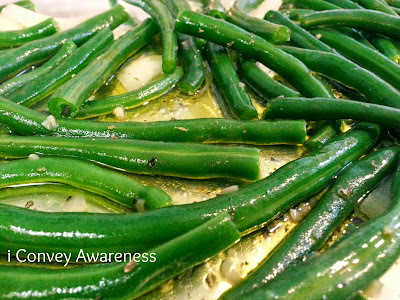 While waiting for the water to boil, make a marinade for the green beans. You'll need 1/4 cup EVOO, the chopped onions, 1/2 tsp minced garlic and 1 tsp dried oregano. When beans have been drained, coat them with the marinade. Roast in the oven at 350 for 20 minutes. Don't rinse the bowl. You'll use this for your potatoes. 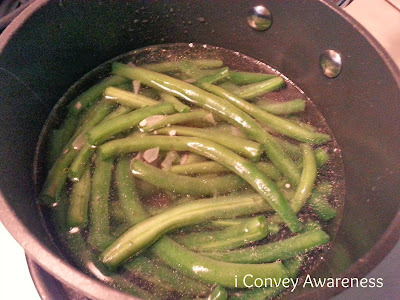 While the meatloaf is baking and the green beans are roasting, boil the water from the drained green beans (may need to add more spring water as necessary). Wash, peel, and cut the potatoes and boil them until the right texture - about 10 minutes. Drain the potatoes and toss them in the bowl from the marinade. (No image.) Mash potatoes with 3 T butter and a splash of the almond-coconut milk. Add S&P as necessary. Your dinner will be done from start to finish in about 60 minutes. If you have a double oven, it helps with completion. If not, no worries - you're baking the meatloaf and roasting the green beans at the same temperature. Be sure to follow Life Made Full on Facebook. I attended a Health & Wellness Fair in Tehachapi, CA on 10/5/13 and visited a chiropractor's booth. His sign said: Dr. Robison will give you $5 if he can't find a weak muscle in your body. I went up to the table and said, you can keep your $5 because you'll find weakness in my arms. Though I've been going to the gym regularly for 6+ weeks, my true strength is in my lower half. I am working on the top half. My assumptions were correct so I booked an appointment to see him in my city. On the forms, I shared that I do not take any OTC or pharma meds but that I eat Juice Plus+ and take fish oil. I also shared with him that I'm a certified health coach and that I've been leading a 6-week #ctransc (Clean Transformation Challenge. See week 1, week 2, week 3, week 4, week 5, and week 6 posts for more information). I met with him last week and he said I was his first patient that only had one bad spot in my back and that overall my back is very strong. To my surprise! My top half is coming along!! The arms, well, they're on their way. He adjusted my traps, clavicle, pecks, and sternum. He adjusted my right ankle and the top right of my back. He performed some muscle testing in addition to the "rack 'em and crack 'em. "He said that he doesn't foresee me having to come back often that "I'll maintain very well" between adjustments. He said that I'm in good shape and that my ligaments are healthy and it's evidence of my clean eating and fitness. More information about what we eat and how it affects the musculoskeletal system, see the Healthy Eating article about "the health of tendons and ligaments, and getting key nutrients to help keep tissues healthy and functional." Learn more about my Clean Transformation Challenge here to make your wellness a lifestyle choice, not a fad, diet, or trend. Updated: Make your own body butter with 4 ingredients. 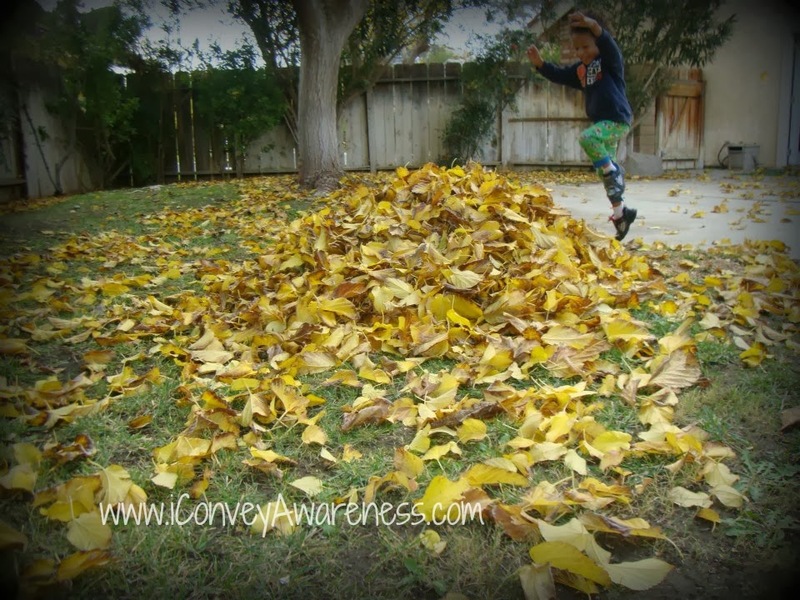 This post is inspired by Scratch Mommy. 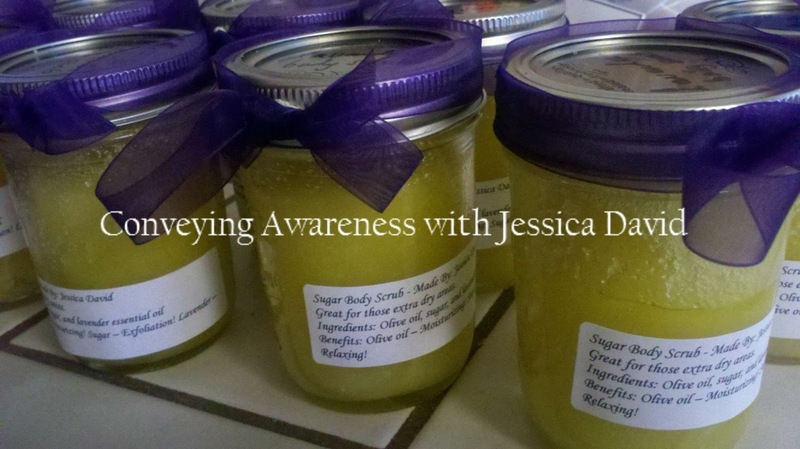 I asked her how I can make a DIY body butter using coconut oil as the main ingredient. She gave me some guidelines and this is what I came up with! It was my first time whipping coconut oil into a body butter and I have to admit, it came out well. Now, I must mention that I don't know how it will hold out in the warmer months but in the coolness of late Fall, it's perfect! My body butter had a very light lavender scent. I will never tire of the scent of lavender. Can you relate? In your mixer, whip the coconut oil until light and fluffy. It may take several minutes. As peaks form, drizzle in the avocado oil. Continue whipping for a minute or two then add in the vitamin E. Finally add the EO of your choice. + You can use any high quality skin oil like jojoba, almond, in place of the avocado oil. + The Vitamin E serves as a preservative is an antioxidant which extends shelf life by preventing rancidity and it's added nourishment to your skin. Find a brand that doesn't have a corn (or GMO) derivative in the ingredients. Vitamin E alone is a sticky substance and requires a carrier oil to make it fluid. The EO pictured above is from an artisan I met at last year's Holiday Craft Bazaar in Ridgecrest, CA. Her handcrafted EO is superb! The 1 oz lavender is $20 plus shipping (pictured is the 1/3 bottle at $7). You can learn more by contacting her at email (remove spaces and parentheses): DanaClair (@) rocketmail.com. She lives in Bishop, CA. Another place I've purchased EOs is Organic Infusions. They are also a small business and based in California. In my next rendition, I am thinking of using cocoa butter and a smidgen of raw honey with the Vitamin E. Essential oil may not be needed since cocoa butter has a light chocolate scent. Though a peppermint EO may make me smell like a peppermint patty and that could be kind of refreshing in the winter months ahead. What EO would you pair with cocoa butter? 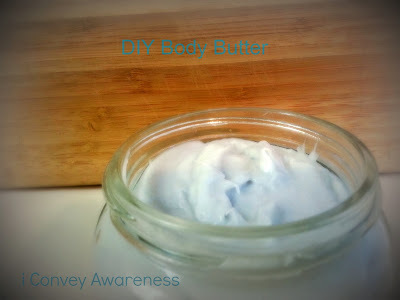 Share your favorite DIY body butter recipe or resource in the comments.